Signed Card to Sealed Deck - in the correct position, yet! Unbelievable! "Mate, this is your best ever! It's really great -- congrats." "I am so glad you finally released your Card to Sealed Deck routine, I love it!!!" "I am so happy to see that you are finally releasing this! I have asked you about it at a couple of conventions and now... I am super excited to get it." "Simply the best card trick EVER, Mark kills with this at every convention." "Fully Loaded Signed Card to Sealed Card Case is just excellent!!!" "I just about never purchase dealer items but I bought Fully Loaded and I'm very pleased with it. The ingenuity of the method, including all the small touches that took you so long to find yet make it work so well, is incredible." "Your trick Fully Loaded is great. Absolutely great and thank you for this." "Thank you for finally releasing this. I haven't been this enthused about practicing a new trick in a long time." "WOW WOW and WOW. Fully Loaded is just WOW. Did I mention WOW." A spectator's signed card appears inside a brand-new, sealed deck of cards. Not only is it in the deck, it is also in the correct position. Mark has been performing different versions of Fully Loaded since 1995. After reading a small manuscript by George Schindler, he was addicted to this effect. Mark has tweaked, re-tweaked and tweaked different methods for the Signed Card to Sealed Deck. What you have here is the method and the gaffs he has been using for the last three years. Over the last 17 years or so, Mark has been asked literally thousands of times if he will ever release his handling to the magic community. This one single item has gotten Mark more bookings for both magicians and laymen than any other piece of magic he has EVER performed. 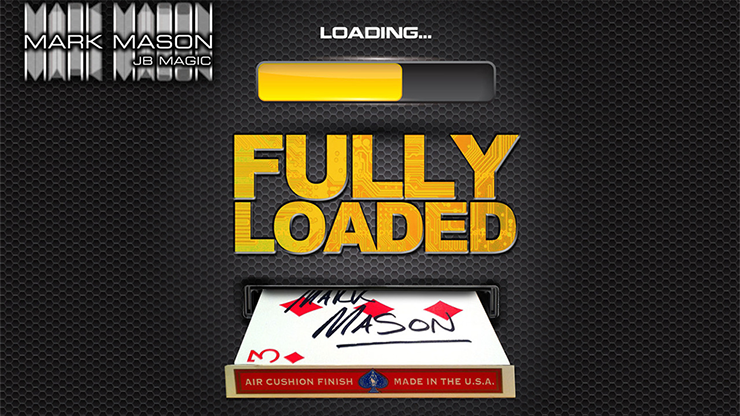 Fully Loaded can be incorporated into ANY card routine. The incredible thing is, it's really not difficult to do and is well within the means of the average card guy. Three HANDCRAFTED locking/unlocking card gimmicks (these help to load the card smoother than silk every time). Then they unlock to become a part of the spread deck. A step-by-step DVD covering everything you need to know about this incredible effect.